Arowana fish generally accept all types of live foods from bullfrog, freshwater shrimps, feeder fish and insects like grasshoppers but that doesn’t mean that they won’t take commercialized dried pellets. 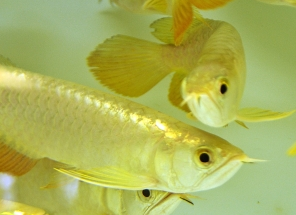 Due to their predatory instinct, naturally they will prefer to feed on something that is still alive whereby they can chase and hunt and since most juvenile arowana that you bought from the pet stores are already trained strictly to live on those diet, getting them to switch to something that consist solely of dried pellets can be rather tough. But before we move further into this topic, most aquarist will always have doubts on whether doing this is the right thing since we are denying the very basic diet that the fish has depended on to survive. Although the general consensus agreed among all arowana keepers are, feeding them live foods will ensure that their precious pets grow at faster pace avoiding the dreaded stunted condition, but however, there are reports saying that feeding pellets with all-rounder complete nutrition can still achieve the similar normal growth rate. How true the finding is, can be very much debatable because as there is no concrete evidence and live experiment that suggest this is fine but rather the observations are based on experiences with quite a number of external factors kick in that could jeopardize the accuracy of the results. Despite all that, why do we chose and decide to introduce this condition to our fish? There are many reasons on why feeding your arowana on pellets is the right thing to do. First of all, most live feeds and even market shrimp if not properly washed will harbor disease bearing bacteria. Feeder fish especially will carry with them tape worms in their stomach and you risk the chance of introducing these parasites when your arowana gobble up those fish. Secondly, certain live foods like bull frogs and shrimp if feed excessively can sometimes cause digestion problems and if you notice that you fish vomiting after feeding, this is a clear signal that they cannot adjust to the meal and overfeeding will make it to become worse. Getting your arowana to accept pellets is not an easy task. Most of the time they would rather go without food and stay hungry than to consume something that goes off the norm. Certain aquarist go to the extent of starving their pet fish hoping that when left with no choice, they will consider taking the pellets but I find that by doing this, you will risk the chance of malnutrition and then subjecting your fish to stressful condition. One of the approaches is to blend the pellets together with their daily meals. For instance, if your arowana fish is based on shrimps diet, then adding the pellets and blend the shrimp together as a paste and then slowly removing the shrimp from the formulation might work. Although chances of success might be slim, it is worth the try if you are keen on your objective to totally convert your arowana to accept only pellets. For me, the best thing to do is to always vary their diet. Feeding too much live foods may not be the right thing to do after all while a diet with only pellets might not be a good thing as well. Using commercially prepared pellets can be used as a staple feed while shrimps, bull frogs can be introduced from time to time. When it comes to selecting your pellets, there are quite a number of reputable fish food brands produced from different manufacturers. The best thing is to check out what they have to offer based on the nutritional information as stated in the content data. My personal preferences have always been Hikari as they even have a special blend of food made for arowana.